Silver, Gold or Platinum? Everyone has their preference when it comes to choosing jewelry. However that choice isn’t limited to precious metals, as Jessica Leigh Filipovitz of Revolve Designs points out with her Declined Credit Card Earrings. A featured finalist in the ReadyMade 100 Competition, Jessica suggests that these DIY earrings can “save the environment and your wallet”. They were one of the top picks by Bill Moggridge who stated: “These earrings look good and will make an excellent conversation starter at any social occasion, as the idea contains a wry element of social commentary about the banking system meltdown…” We agree with Bill, and we think this clever project offers a great alternative to throwing away your credit cards after they have passed their expiration date. The best bit is they can be made in just 3 simple steps. Something about those earrings just seems to right to me. Silver, Gold or Platinum? Everyone has their preference when it comes to choosing jewelry. 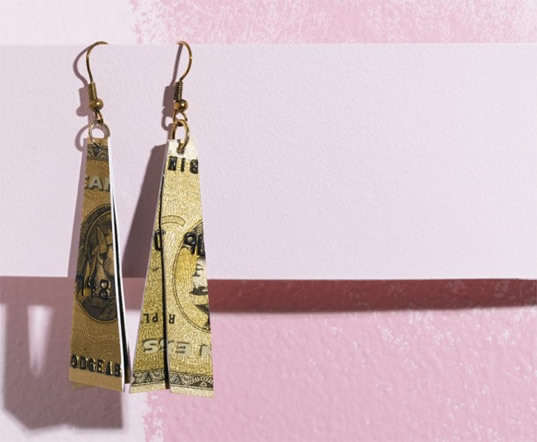 However that choice isn't limited to precious metals, as Jessica Leigh Filipovitz of Revolve Designs points out with her Declined Credit Card Earrings. A featured finalist in the ReadyMade 100 Competition, Jessica suggests that these DIY earrings can “save the environment and your wallet". They were one of the top picks by Bill Moggridge who stated: “These earrings look good and will make an excellent conversation starter at any social occasion, as the idea contains a wry element of social commentary about the banking system meltdown…” We agree with Bill, and we think this clever project offers a great alternative to throwing away your credit cards after they have passed their expiration date. The best bit is they can be made in just 3 simple steps.